The exhibit, “Collective HER-story, A Mosaic Masterpiece: Exploring the Carey C. Shuart Women’s Archives” comes to a close this week. This ambitious exhibit, featuring a broad and eclectic range of history representative of the Shuart Archives, opened on October 14, 2013 and enjoys its final weekend at the M.D. Anderson Library, running through Sunday March 2nd. From Mayor Annise Parker to the Gorilla Girls, from former Mayor Kathy Whitmire to the WNBA’s first dynasty, the Houston Comets, the “Collective HER-story” exhibit has a little something for everyone. The M.D. Anderson Library and exhibit are open to the public over the weekend. 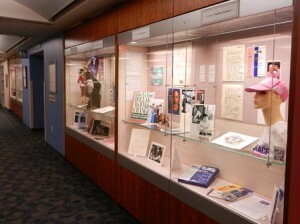 The “Collective HER-story” exhibit can be viewed on the first and second floors of UH’s M.D. Anderson Library (Exit 1 off Calhoun Road). Come catch it (one last time) before it closes. The exhibit may close, but the legacy of these women and study of their history will endure. 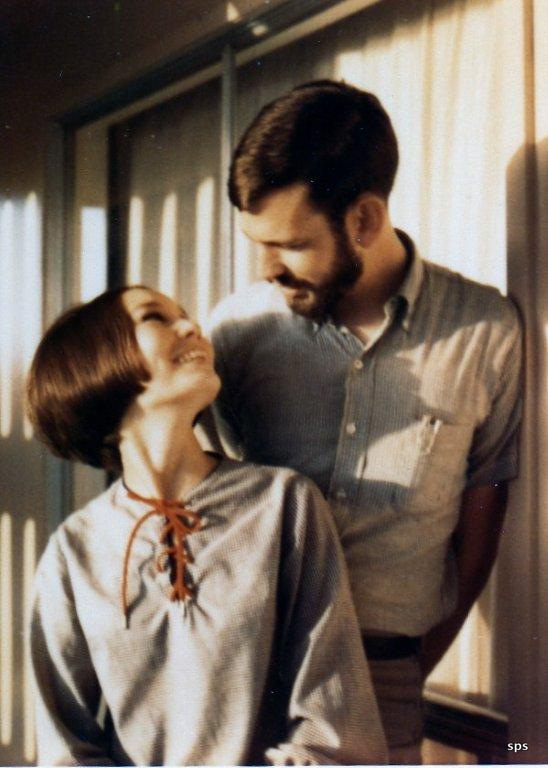 Archivist Vince Lee of the Carey C. Shuart Women’s Archive and Research Collection will showcase artifacts from the recently acquired Toni Beauchamp Papers at Table Talk 2014, presented by the University of Houston Friends of Women’s Studies on Thursday, February 27th. 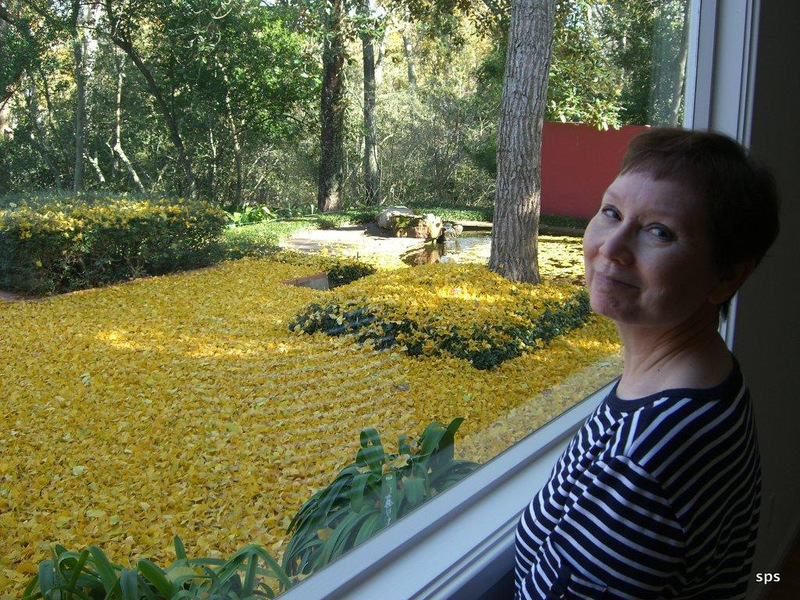 Defining Toni Beauchamp’s legacy in Houston is an exciting challenge. The term “patron” was often applied to her during her lifetime and certainly remains today. However, her involvement with art went beyond mere patronage, and we may find that word to be too narrow, now. The role of art was exemplified into two spheres in her life, civic duty and personal advocacy. Her involvement and leadership on such public projects involving the renovation of Buffalo Bayou and Market Square Park fulfilled a vision that art, thoughtfully integrated with urban design, results in beautification, preservation, and forging an identity for the community. Art was also very personal for Toni. Art provided her a means to shape and influence the community, forge friendships, and most importantly it was an opportunity for her to educate and share information with others. 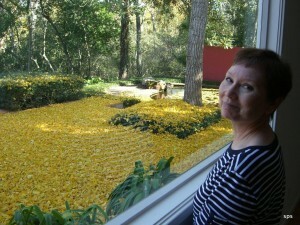 Her connection to the University of Houston dates back to 1973, when she earned her BA in Art and where she would later serve as assistant director of the Blaffer Gallery. 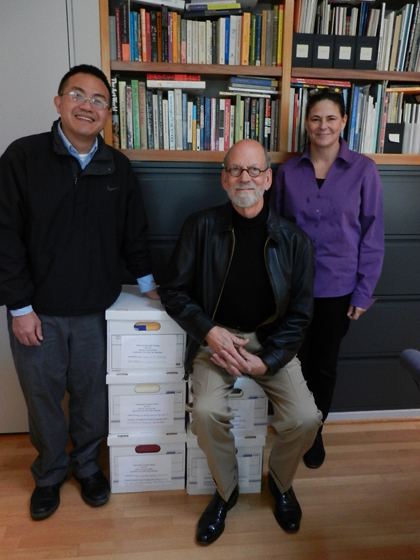 The acquisition of her papers, thanks to the generosity of her husband Jeff Beauchamp, has us very excited to begin the work of processing, arranging, and making these materials available for study to scholars both local and abroad. These papers complement other offerings in Special Collections like her collection of essays, Good, and “Remembrances of Toni” (a collection of reflections on Toni’s life) compiled by her husband Jeff. The spirit and legacy of Beauchamp make her papers a natural fit amongst the other bold women at the vanguard, whose collections grace the stacks of the Shuart Women’s Archive. At Table Talk 2014 Vince Lee will have artifacts from Toni Beauchamp’s work on Good, as well as her involvement with the “Buffalo Bayou Master Plan” and “Market Square Park Project.” Friends of Women Studies hosts the annual Table Talk series, “a fascinating combination of conversations over lunch, led by dynamic women of various cultures, professions and experience at each table,” benefiting Women’s, Gender & Sexuality Studies at the University of Houston. A list of Conversationalists attending this 17th annual Table Talk can be found here. Time permitting, be sure to attend Table Talk 2014 and visit with Vince Lee for more information regarding the legacy of Toni Beauchamp, the research potential her papers will offer, and their new home in the Carey C. Shuart Women’s Archive and Research Collection. The following comes to us via Julie Grob, Coordinator for Digital Projects & Instruction here at the University of Houston Special Collections. 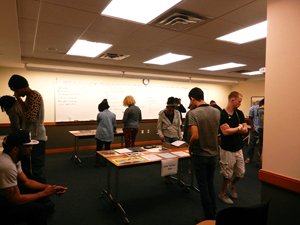 Undergraduate students from the course African American Studies 3301, Hip Hop History and Culture taught by Professor John Chiles, visited Special Collections Thursday night. 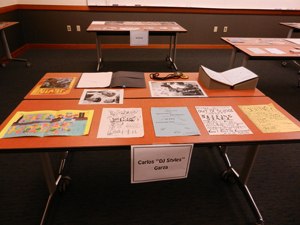 Students viewed materials from the DJ Screw Papers and the newly acquired Carlos “DJ Styles” Papers, as well as items related to Houston artists such as Geto Boys, K-Rino, and UGK. Students teamed up in pairs to analyze individual items, and reconvened to discuss as a group how these items shed light on issues such as identity, gender, entrepreneurship, and Afrocentrism. The students enjoyed the chance to see original hip hop artifacts in person. A reminder to faculty that you may make arrangements to bring a class to use Special Collections materials on a variety of topics by contacting Julie Grob. In lead up to the premiere of “The Rise and Fall of Penn Station” this evening on PBS (9pm/8pm CST), American Experience has been soliciting contributions to its Engineering Map of America. A number of academic institutions have partnered with American Experience to assemble an interactive map of some of America’s greatest engineering endeavors. Valerie Prilop, our Digital Collections Librarian, has contributed a number of resources from the University of Houston Special Collections. Today, we highlight a few of these. The Houston Ship Channel: The Houston Ship Channel is a man-made channel for ocean-going ships that supports the Port of Houston, the nation’s busiest port in terms of foreign tonnage and the second largest petrochemical complex in the world. 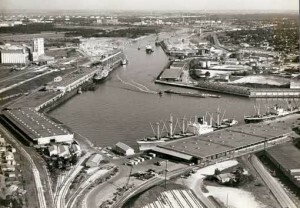 The channel, which officially opened on November 10, 1914, after its completion on September 7 of that year, was originally a swampy bayou and surrounding marshland with dense vegetation. Steamboats and shallow draft boats were the only vessels that could navigate the waterway and the dredging and deepening of the channel contributed greatly to the growth of Houston and Texas. Even after its official opening, the channel continued to be widened and deepened. It now measures 45-feet deep and runs up to 530 feet in width. The entire channel stretches 52 miles from the Gulf of Mexico through Galveston Bay and up the San Jacinto River, ending less than 10 miles east of downtown Houston at the Turning Basin. 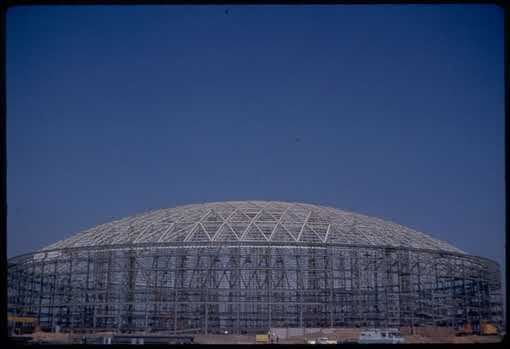 The Astrodome: Upon its completion in 1964, the Reliant Astrodome was the world’s first completely enclosed stadium, the first air conditioned stadium, and the largest domed structure, and when it opened as the Harris County Domed Stadium in April 1965 it was called the Eighth Wonder of the World. A major engineering challenge was how to span 642 feet, an unusually large area for a roof structure, without interior supports. The final design used a steel lamella trussed roof structure. 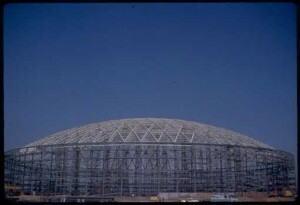 The resulting 660-foot-wide circular roof was at the time of completion the largest self-supporting dome. 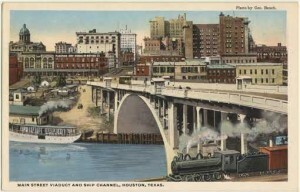 The Main Street Viaduct: From the time of its founding, Houston relied on bridges for connecting the city and allowing commerce to flourish. Buffalo Bayou, upon which the city was founded, presented a major challenge to mobility as it separated the north and south ends of the city. To answer this problem, planning started in 1911 to build a monumental bridge across Buffalo Bayou. An extension of Main Street, the bridge was to extend 1,650 feet across the water. When it was completed in 1913, the Main Street Viaduct was the largest single-arch concrete span in Texas, with the central arch measuring 150 feet. The cost of construction was a half a million dollars, and the bridge was high enough to allow for several railroad tracks to pass underneath. View all of these and more on the Engineering Map of America!